Hello, hello! 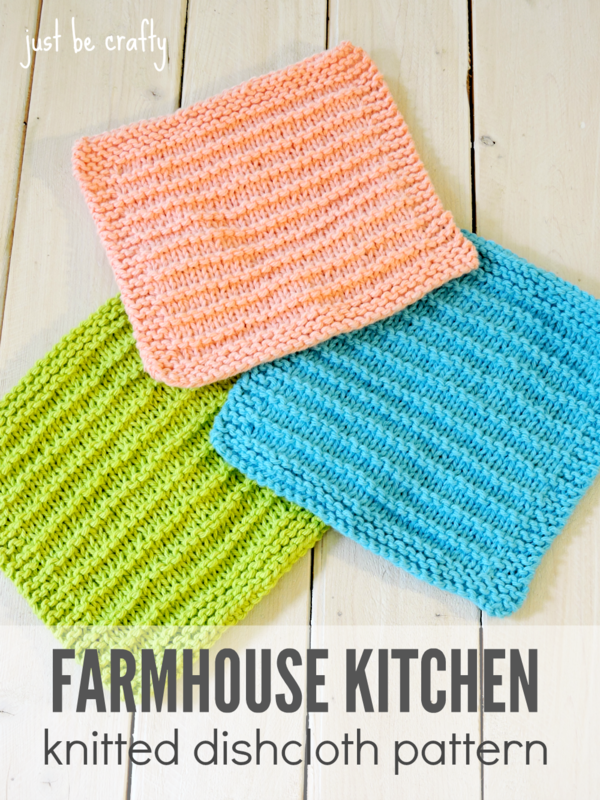 Hot off the press… I have a brand spankin’ new pattern to share today – the Farmhouse Kitchen Knitted Dishcloth! The modern farmhouse style is so in right now, thanks to Chip and Joanna Gaines and their series Fixer Upper. If you haven’t already seen the show, please please check it out! They fix up old homes for home buyers and have the most beautiful classic style and are absolutely hilarious. It’s one of my favorite shows right now, and these dishcloths were inspired by Joanna’s pristine white/neutral kitchens and the farmhouse sinks in them! In my opinion, these bright dishcloths would make those kitchens POP! 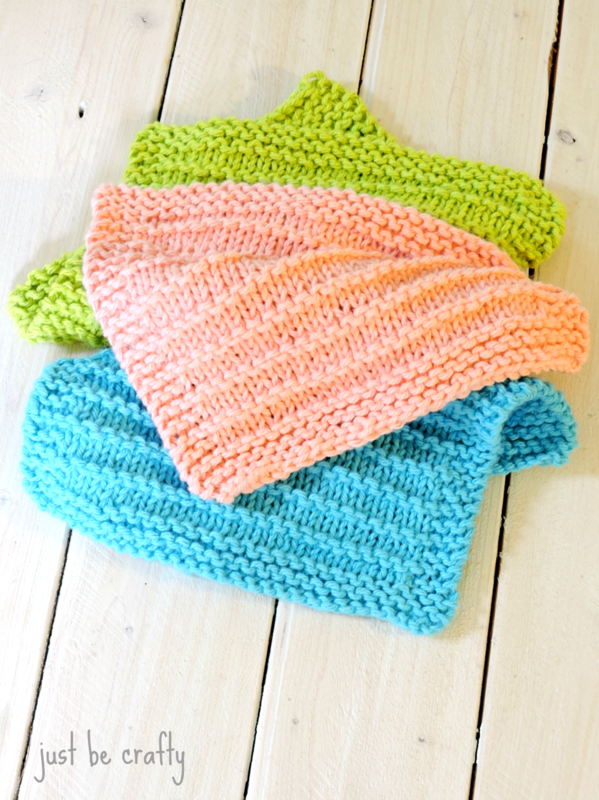 It’s a super fun and easy pattern and great for beginners! 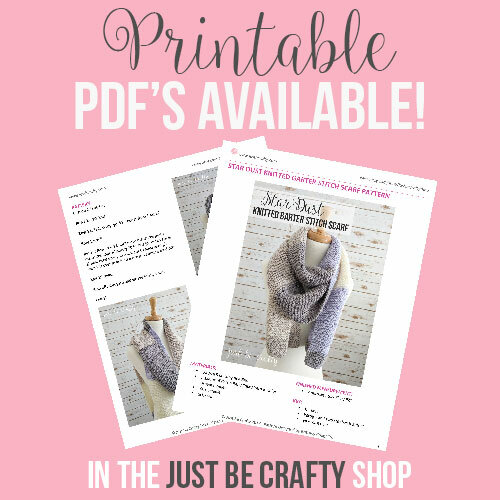 See below for the free pattern. And a printable version of this pattern is available for purchase here! You should have just now ended on a “right side”. Beginning on the “wrong side”, knit the next 3 rows. Next row, BO. Cut yarn and weave in your ends. Hi Brittany! I knitted a Farmhouse Dishcloth last night and really enjoyed it 🙂 also have made several seed stitch and textured discloths that turned out really well. I just love using them. Plus, made some knitted cocktail coasters — really sweet! Thank you so much for all the great free patterns! Hi Pam! Thank you so much!! I am so happy you enjoyed the patterns! You made my day!! I’d love to see them, please feel free to upload photos to the Just Be Crafty Facebook Page!!! I searched facebook for a page called Just Be Crafty and nothing came up. What is the name of your page? Hi Sande! You can find my my Facebook page at the link below. Hope to see some of your projects there! Brittany, thank you for the very simple dishcloth pattern. I am always looking for different patterns. I’ve probaby knit at least 1500 dishcloths over the last few years. I’ve given most all of them away. I can make one in an afternoon. I’ll make a few of your pattern while I’m watching a good movie or a ball game. Thanks again. Thanks, Stacy, for that simple dishcloth pattern. I, too, am “addicted” to knitting dishcloths. I’ve probably made over 1500 in the last few years and I have about five favorite patters. One is the simple seed stitch pattern with a plain knit border around it. I can make one in a day while I’m watching TV. I’ll make several of your pattern as that, too, is very simple. We’ll just keep on knitting and knitting and knitting and will keep the fingers nimble. At 84, this is my biggest challenge. Hi Dolores! 1500 dishcloths!!?? Wow, that’s so impressive!! 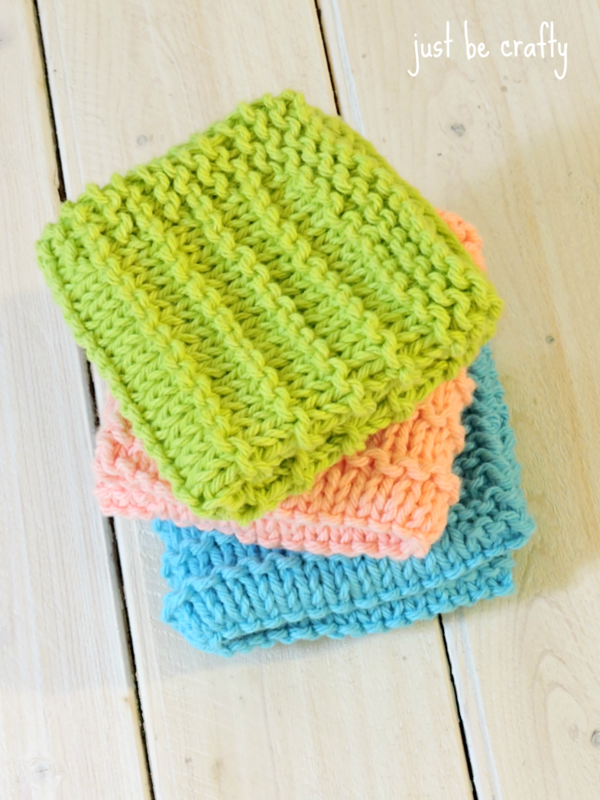 Homemade dishcloths are definitely so much better than store bought! Thank you for leaving a comment and stopping by and I am so happy you are enjoying the patterns! You’ve made my day! I loved making this dishcloth! I added the pattern to Ravelry cuz I couldn’t find it there. May I have your permission to use your photos on the pattern page? This was a very simple pattern for a beginner knitter like me. I love the simple look to it. Thanks for sharing ! 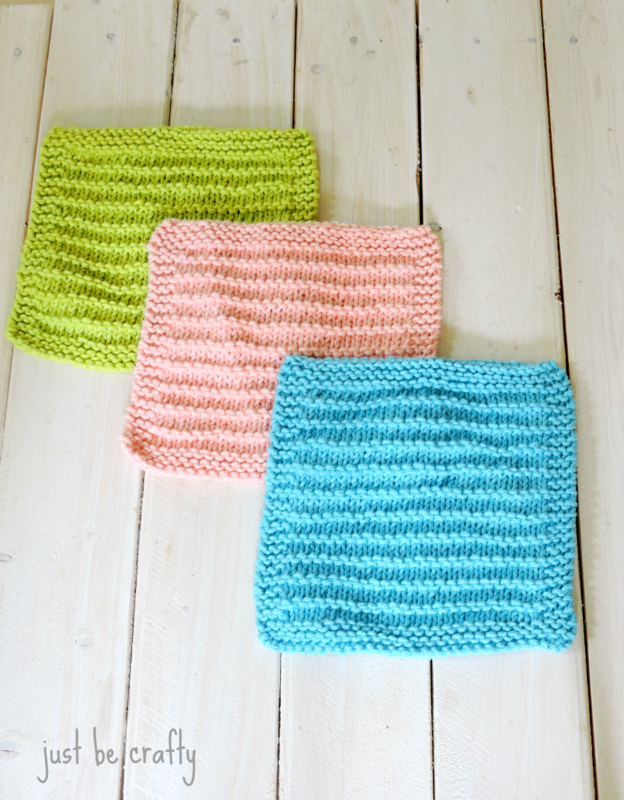 Can You get 2 dishcloths from 1 ball of yarn? Hi Anne, thanks for stopping by! I’m glad you enjoyed the pattern! Yes, you should be able to get two dishcloths from one skein of Lily Sugar’n Cream yarn. My side edges didn’t come out as even and smooth as yours. Can you share your secrets? Hi Netta! What type of issue are you having with your sides? Are they bunching up and a bit shorter than the middle? If so, I would suggest to wet block it. To wet block you will need to wet your dishcloth, shape it into an even square and lay it to dry flat. That should take care of the issue! I cannot wait to try this pattern! I am a knitting newbie 🙂 Question: would any cotton yarn work for this? I’ve tried to work with the Sugar n’ Cream yarn and I have such a hard time with it! Not sure why. Hi Katie! Yes, any worsted weight 100% cotton yarn would work! Let me know how it goes :). Thanks again, Brittany for another great dishcloth pattern! Looking forward to trying the Farmhouse pattern. I’ve made all your others & enjoy them myself and for gifts. I do use the Sugar ‘n Cream-so many great colors. And they wash & dry fine in the washer and dryer. Keep it up! I absolutely love this pattern, however feel it’s just a bit too small for my needs. I’ve tried increasing my cast on and worked rows, but have ended up with more rectangular products than square. Any suggestions on how to make a slightly larger cloth in the correct proportions? Am I looking at the photo and reading pattern wrong? *Not* counting the cast on/bind off edges and the sides, the main/middle section looks like several rows of stockinette stitch (K a row, P the next), followed by a row or 2 of garter stitch (K all). I am wanting to make this but I am not good at ripping out and starting again (get frustrated). Thank you for sharing. This looks like a great dishcloth! I am also looking at pattern and from photos it looks like row 8 should be a purl row to give it stocking stitch look between the garter stitch rows? I came across this, while drinking my morning coffee. I am a newby knitter, so I am anxious to give this a try. Thanks for the free pattern. Looking forward to more awesome dishcloth patterns!!! Thank you for sharing this pattern! I found it by chance after a long break from knitting and have now made 2 washcloths with this pattern and they turned out great. I’m going to try the weave pattern next, maybe with the scrubby yarn as well as the cotton to give it extra scrub power. Thanks again and I look forward to doing more of your patterns!! Is it okay to sell my finished project using your pattern? I am not mass producing them. 🙂 Thank you.